Indoor air pollution is the presence of one or more contaminants indoors that carry a certain degree of human health risk. Indoor air issues may be traced to the beginning of civilization. Prehistoric records note the problem of smoke in caves. However, over the last three decades the public has become more aware of indoor air pollution. Various studies show that people spend 65 to 90 percent of their time indoors; 65 percent of that time is spent at home. Field studies of human exposure to air pollutants indicate that indoor air levels of many pollutants may be two to five times, and on occasion more than one hundred times, higher than outdoor levels. SOURCE: Adapted from U.S. Environmental Protection Agency and Consumer Product Safety Commission. 4. Hang dry cleaned clothes in an open area for about 6 hours. There are various sources of indoor air pollutants in any building. A partial list of common sources is given in the table. Several types of combustion sources release inorganic gaseous pollutants, formaldehyde, suspended particulates that can be breathed, and other toxic chemicals. Tobacco products also release a mixture of over 4,000 compounds. The pollutants released from building materials include formaldehyde, asbestos, and to a lesser extent radon. Formaldehyde is used in a variety of products, ranging from lipstick and shampoo to kitchen cabinets and carpeting, because it is an excellent preservative and bonding agent. Pressed wood products and furniture made with these products are found in offices and homes throughout the world. Urea-formaldehyde foam insulation is one of the major sources of formaldehyde. Asbestos, a known human carcinogen , is a mineral fiber that was widely used in a variety of building materials and as an insulating material and fire retardant in the United States until its use was banned in the early 1970s. Indoor radon problems generally result from the entry of radon gas released as a result of the radioactive decay of uranium found in soil around the house and in the geological formation under the foundation. Building materials such as granite, clay, bricks, rocks, sandstone, and concrete containing alum shale may also be major sources of radon, depending on their uranium content. The pollutants released due to overcrowding of humans or animals include bioaerosols . Most of the bioaerosols present in the outdoors are induced indoors either by natural or mechanical intake of the ventilation systems. Humidifiers, air conditioning systems, cooling towers, mechanical ventilation systems, air-distribution ducts, and areas of water damage are the best breeding places for these bioaerosols. Pets are sources of saliva and dander. Heavy metals such as lead, mercury, cadmium, and chromium have been found indoors. Their levels depend on the concentrations in outdoor air and the surrounding soil and dust. The residential use of lead paint was banned in the United States in 1978, decades after being outlawed in much of Europe because of the danger it posed to children. Residual lead paint is still present in many older buildings. Adapted from the National Institute of Occupational Safety and Health. Household products and personal care items are a constant source of indoor air pollution. Hobbies such as welding and soldering can easily add more pollutants to indoor environments. Office machines and domestic air cleaners are a major source of ozone. There are a variety of causes of poor indoor air quality. 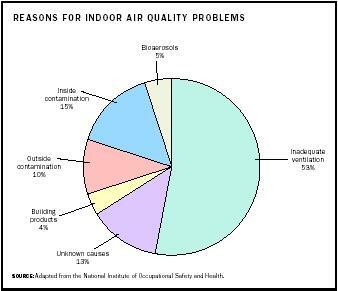 A NISOH study based on over five hundred complaints found that inadequate ventilation and the release of contaminants from indoor and outdoor sources are the primary reasons for indoor air quality problems (see pie chart). Inadequate ventilation may be defined as insufficient air to remove pollutants that are degrading the quality of air. Thus, the air quality in a building is the result of a contest between the pollutants and the ventilation system. Other factors that can aggravate this situation are temperature, humidity, and microbial contamination. The early shutdown and late startup of a ventilation system and insufficient fresh outdoor air entering a ventilation system are often the direct result of overzealous energy-saving procedures. The problems of poor air distribution by a ventilation system within a building, limited air mixing in occupied areas, and clogged filters can contribute to poor air quality. Since the early 1970s buildings have been built to be more airtight to conserve energy. This has resulted from using improved construction techniques and caulking and sealing. Unfortunately, this practice limits the amount of polluted air that escapes, which can cause pollutants to build up to unhealthy levels inside a building. Temperature and humidity extremes can affect the emission rates of some pollutants as well as the perceptions of building occupants. High humidity and high temperature cause people to feel lethargic and want more air movement. Low humidity induces coughing, dry throats, and dry eyes. An additional problem with low humidity is that it accentuates sense of smell. Noise from mechanical systems or glare from lights can cause headaches and fatigue. 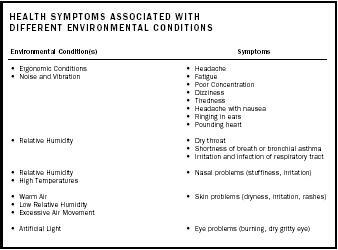 These are all symptoms of sick building syndrome and are thus usually blamed on poor air quality. Health effects due to indoor air pollutants may be short- as well as long-term. Short-term problems include a stuffy, odorous environment and symptoms such as burning eyes, skin irritation, and headaches. Long-term health problems have a longer latency period or are chronic in nature. The magnitude and duration of detrimental health effects are influenced by the time of exposure, concentration, presence of a preexisting unhealthy condition, and age. Health conditions involving some allergic reactions, including hypersensitivity pneumonitis, allergic rhinitis, and some types of asthma, are triggered by bioaerosols. Symptoms related to bioaerosols include sneezing, coughing, shortness of breath, fever, and dizziness. Infections such as influenza, measles, and chicken pox are also transmitted through the air. Overall, poor air quality may be responsible for a decrease in work performance, general feeling of poor health, reduced ability to concentrate, or illness. 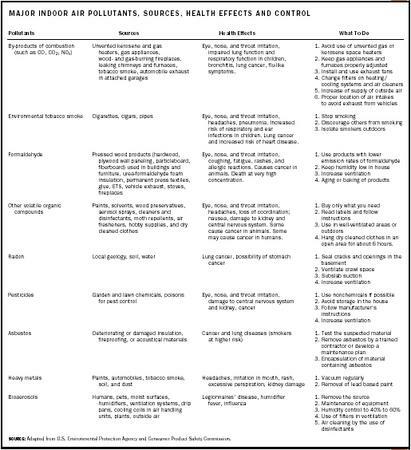 Basic approaches to control indoor air pollution include source control, source isolation, increased ventilation, dehumidification, and the use of filters (see the table). Possible sources of contamination are eliminated in a source-control strategy. Examples include banning smoking in public buildings, using carefully selected building materials to avoid the emission of toxic or irritating substances, and limiting the use of fibrous materials. Source-isolation strategy is used in situations where a source cannot be completely eliminated. For instance, copy machine areas, food service stations, and bathrooms are often separately vented outside buildings to avoid the recirculation of return air. Existing sources of pollution such as leaded paint and asbestos insulation may either be removed or encapsulated. Increased ventilation and filtration are traditional approaches to ensuring good indoor air quality. Dehumidification helps in the reduction of microbial growth. Low humidity should be maintained inside a house to limit the growth of such bacteria. Devices based on the principles of absorption and adsorption are finding applications in controlling indoor air pollutants and moisture. Solid and liquid desiccants have been found effective in removing moisture and a wide range of pollutants. Silica gel, activated alumina, and activated carbon are also used to adsorb gases and vapors. Spider plants have been found to absorb some volatile organic compounds (VOCs) from indoor air. The number of lawsuits filed in the area of indoor air pollution dramatically increased between 1970 and 2001. The U.S. Environmental Protection Agency's Building Assessment Survey Evaluation found that in the worst buildings of the first study group, approximately 30 to 40 percent of occupants experienced headaches, unusual fatigue or drowsiness, and dry, itching, or otherwise irritated eyes at least once a week. In the best buildings of the same study group, 6 percent of occupants experienced unusual fatigue or drowsiness. Under these circumstances, the possibility of complaints filed in relationship to indoor air quality will not become remote in coming years. SEE ALSO A SBESTOS ; A STHMA ; H OUSEHOLD P OLLUTANTS ; L EAD ; M OLD P OLLUTION ; P ESTICIDES ; R ADON ; T OBACCO S MOKE . Hays, Steve M.; Gobbell, Ronald V.; and Ganick, Nicholas R. (1995). Indoor Air Quality: Solutions and Strategies. New York: McGraw-Hill. Turiel, Isaac. (1985). Indoor Air Quality and Human Health. Stanford, CA: Stanford University Press. American Lung Association Web site. Available from http://www.healthhouse.org/iaq . Occupational Safety and Health Administration (OSHA) Web site. Available from http://www.osha-slc.gov/SLTC . U.S. Environmental Protection Agency Web site. Available from www.epa.gov/iaq . Legionnaires' disease is a relatively rare type of pneumonia that is caused by Legionella pneumophila, a bacterium found primarily in warm-water environments. It was first identified when thirty-four people attending a 1976 American Legion convention in Philadelphia contracted the disease and died. The exact source of the outbreak is not known with certainty, but it is believed the bacterium was growing in an air conditioning tower on the roof of the old but well-maintained hotel where the conference was held. The disease is contracted by inhaling airborne water droplets containing Legionellae. It infects 10,000 to 15,000 persons annually in the United States and has a mortality rate of 20 to 50 percent. Symptoms associated with building-related health problems are commonly referred to as sick building syndrome. The American Society of Heating, Refrigerating and Air-Conditioning Engineers describes a building in which more than 20 percent of its occupants report building-related illness as a sick building. Symptoms include, but are not limited to, irritation of eyes, nose, and throat; dryness of mucous membranes and skin; erythema; mental fatigue; headaches; airway infections; coughing; hoarseness; wheezing; nausea; dizziness; and unspecific hypersensitivity. It is difficult to identify specific causes of the problem. The complaints reported by the occupants of "sick buildings" are generally nonspecific in nature and, therefore, it is very hard to establish a causal relationship between symptoms and pollutants present in the building. THANK YOU FOR BREAKING DOWN THE ABOVE TOPIC SO SIMPLY YET SO SIGNIFICANTLY.I HAVE USED IT FOR MY ASSIGMENT. Thank you for your article. There was not mention of molds. I can't afford to tear out my laminent floor in my bathroom. It is obvious that the wood is full of moisture and bowing,cracking and dark moist areas. How do I get an inspection on a slim budget? I have been very sick and fatigued and they contribute all of it to Fibromyalgia, but I don't. I use to work in a school that was built on a marsh and had chronic mold and ventilation issues. When I was off for the summer, I got better. Then when I was back in the school, in less than a month me along with others complained of an all kinds of health issues.